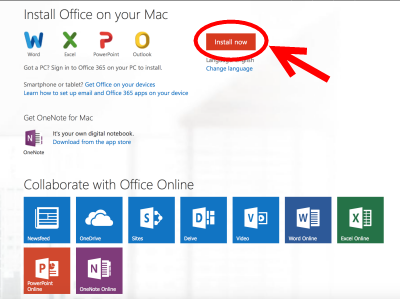 Etown's licensing agreement with Microsoft now provides Office 2016 for PCs and Macs for free to currently enrolled students, all faculty and staff. Students, faculty and staff are able to download Office to their personal computers and mobile devices. Students are limited to 5 total downloads from their account (including laptops, desktops, and mobile devices). This means Office 2016 cannot be put on more than 5 laptops, desktops, or devices (or any combination thereof). 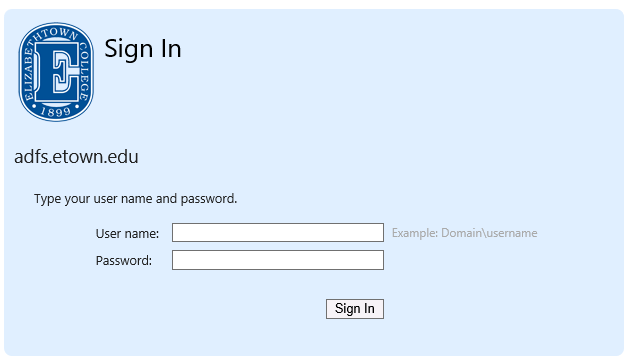 Step 1: Using a web browser, navigate to https://portal.office.com/home. 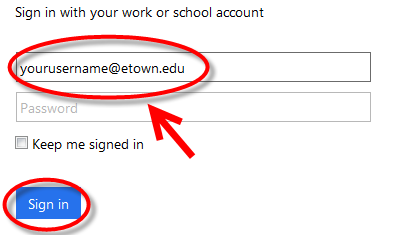 Step 2: Type "yourusername@etown.edu" into the email sign-in bar on the right of the page. Click Sign in or press [Enter]. Step 3:You will be redirected to an Etown sign-in page. Enter your Etown email and password, and click Sign In. 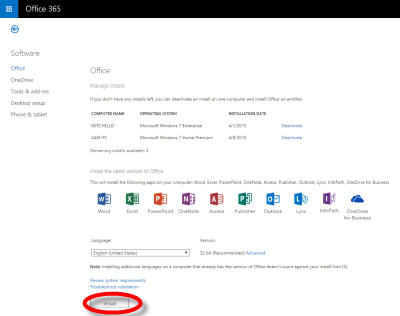 Step 4: On the Office 365 opening page, scroll to the bottom of the page and click Install. Faculty and staff should NOT install Office on their college-owned machines with these instructions. This is for personal machines only. 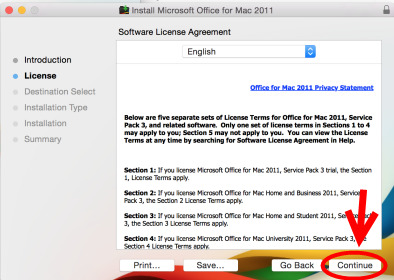 If you want to upgrade to Office 2016 on a college-owned machine, follow these instructions. 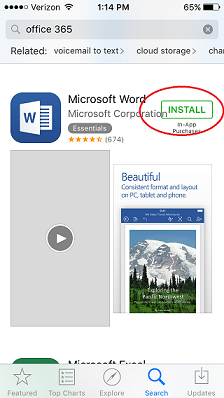 Step 5: On the Install page, scroll to the bottom of the page and click Install. 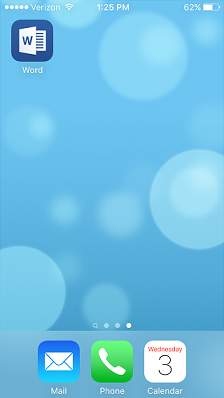 Step 6: A download bar will appear at the bottom of the screen. Click the download bar to download the file. Step 7:When you click the download bar, a window will pop up asking if you want to run the file. Click Run. Note: When Run is clicked, a loading screen will appear. Wait for this to finish before moving on to Step 8. Step 8:The Office start window will appear, as well as a background downloader. Click Next on the start window. Step 9:The window will ask you which settings you wish to use. Select Use recommended settings, then click Accept. Step 10:An introduction video will begin to play. After it has finished, click Next. 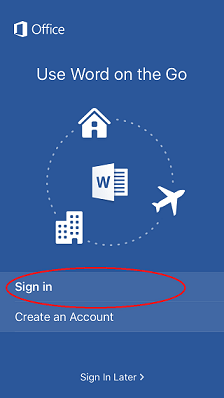 Step 11:The window will ask you to sign in. Click Sign in. Step 12:A window will appear asking you to enter an email address. Enter your Etown school email and click Next. Step 13:The window will ask you to sign in using both your email and password. Enter your Etown email and password, then click Sign in. Step 14:A OneDrive window will appear. Click Next. Step 15:The window will ask you to choose a theme. select one and click Next. Step 16:The window will give you the option of going online to the Microsoft website. To skip this step, Click No, thanks. Step 17:The window will show you the installation progress in the orange bar. Wait until it has completed. Step 18:When it has finished, the window will tell you that the installation has finished. Click All Done. You have now installed Office for offline use. Step 1:Go to http://portal.office.com/home and type in your Elizabethtown College email. Press [Enter]. Note: You will automatically be redirected once you have finished typing in your college email address and pressed [Enter]. Step 2:Log in using your Elizabethtown credentials. 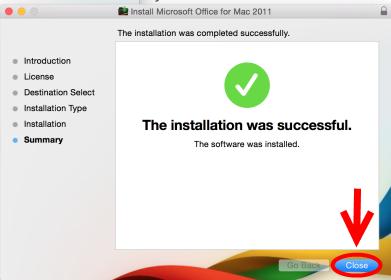 Step 3:You will be taken to the install Office screen. Review the settings and click Install. 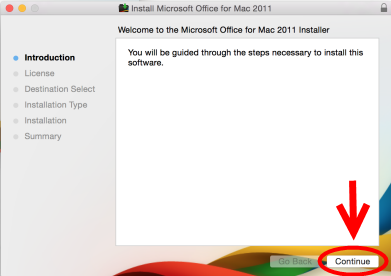 Step 4:Once you've clicked Install, it will launch the installer software download. 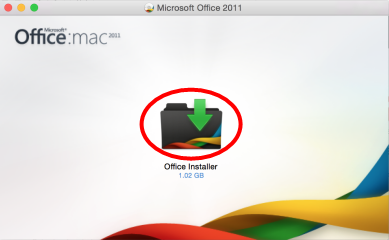 After the installer is done downloading, double-click the indicated folder to begin the installation process. Step 5:Click Continue. 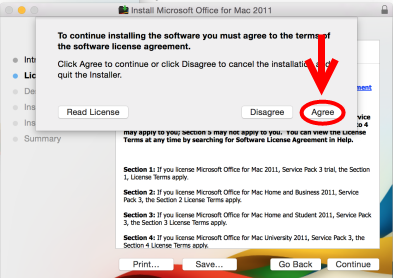 Step 6:Read the Software License Agreement and click Continue. Step 7:Click Agree. 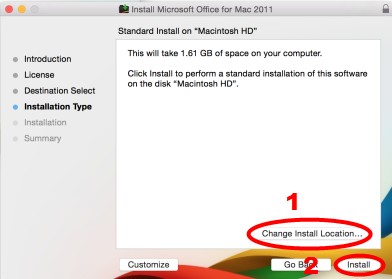 Step 8:Select the Install Location and then click Install. 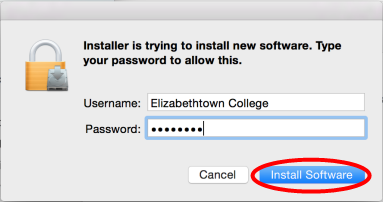 Step 9:Enter the username and password that you use to log in to your computer (not your Etown username and password) and click Install Software. Step 10:Once Office has been installed, click Close. The example mobile device used in these instructions is an iPhone. Android devices have a similar setup and Office apps can be installed on them by following these instructions. 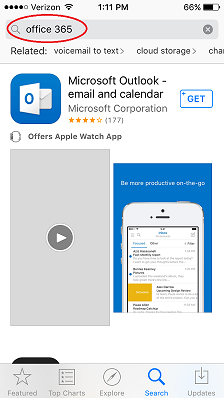 Step 1:Go to the app store and search for Office 365. 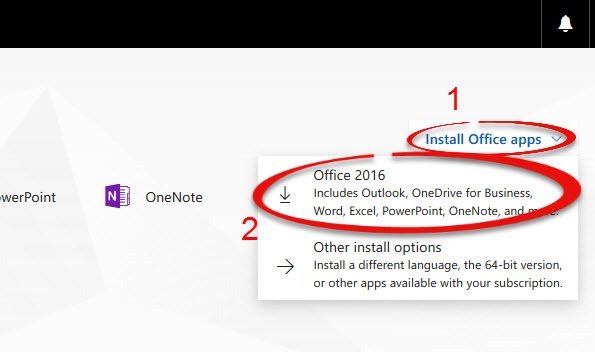 Each Office program (Word, Excel, PowerPoint, Outlook, OneNote) will display as a separately downloadable app. 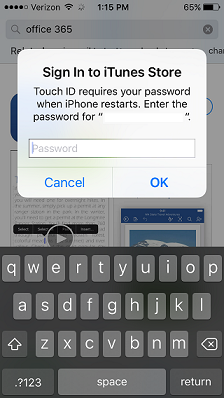 Step 3:Sign into the App store if prompted. 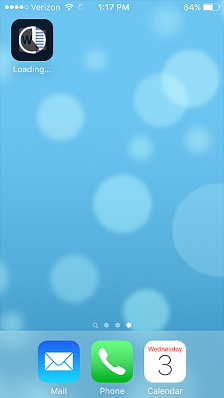 Step 4:Tap on the app to open it once the installation has completed. Step 5:Click Sign In to use your Etown account. Enter your Elizabethtown College email address and tap Next. 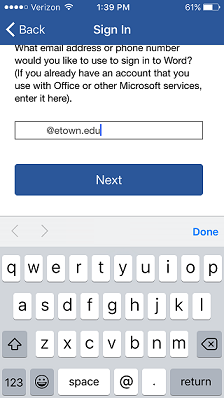 Choose to Sign In with your Work account, this will allow you to use your etown.edu account. 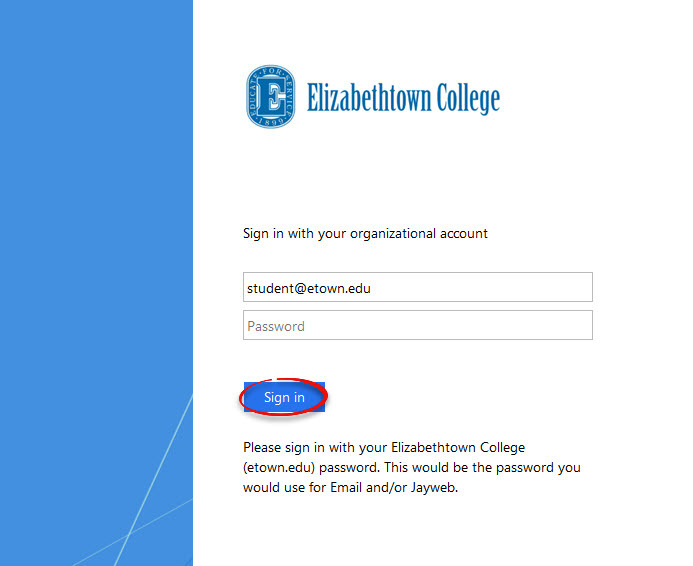 Step 8:Enter your Elizabethtown College credentials when the Authentication Required screen appears. Click Sign in. 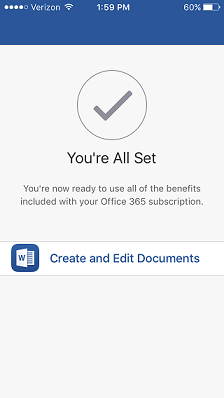 Step 9:You are now logged in to Office 365 on your mobile device. Step 10:You can use the app to access your OneDrive files. 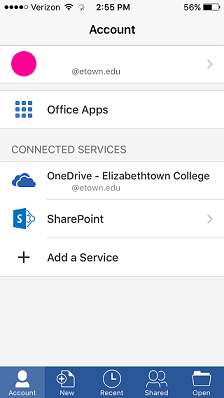 Licensing for Office 2016 and Office 365 is only available to students, faculty and staff while they are enrolled/employed at Elizabethtown College. Accounts will expire after no longer employed/enrolled and the files saved to the account will become read-only. 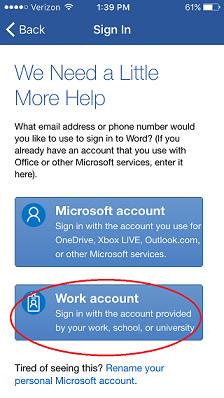 When installing, you may be asked if you already have an existing account or need to create a new one. DO NOT sign up for a free account. 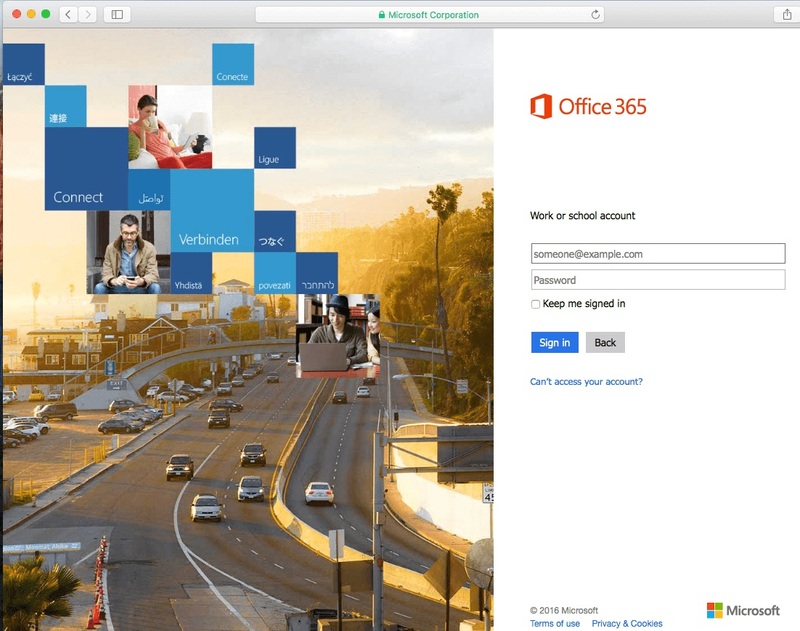 Video instructions for how to download Office 365.